Think of Aurius as your very own radio station on your desktop. Using Aurius you can transmit any audio your computer can generate ... from movies to music ... to any FM stereo in your house. It combines the best of USB Audio with a high quality FM transmitter ... all in one neat little package! The Aurius also has a separate stereo line out so that you can use it with any powered speakers or stereo. And best of all, it's simple to set up and operate; just install a little software, plug in one cable, and you are on the air. Our groundbreaking 3rd generation RF wireless remote control for the iPod. Forget everything you thought you knew about remote controls for the iPod. Forget about what others are offering. Your iPod needs this remote! Our 3rd genration wireless remote control for the iPod uses the very latest in RF technology to provide the very best features. Like the original ... only better! 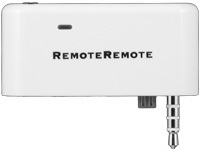 The RemoteRemote 2 uses RF technology, so it works around corners and through walls. Plus it's easy to use ... just plug the receiver into the top of the iPod, and you're good to go! Works with headphones or stereo cable connection. Now color matched for the U2 Special Edition iPod. Based on the same proven RemoteRemote RF technology, so it works around corners and through walls. Plus it's easy to use... just plug the receiver into the top of the iPod, and you're good to go! Like the original ... only smaller! The RemoteRemote mini uses RF technology, so it works around corners and through walls. Plus it's easy to use ... just plug the receiver into the top of the iPod, and you're good to go! Finally, wireless remote control for your iPod. And unlike IR based systems, RemoteRemote uses RF technology, so it works around corners and through walls. Plus it's easy to set up ... just plug the receiver cable into the top of the iPod, plug your headphones into the receiver module, and you're set!